A Mudworm's Thoughts » Blog Archive » A Four Activity Weekend (Road Biking, Climbing, Trailwork, MTB) = Rad! The weekend started on Friday afternoon. Made a last minute decision that I would ride over the hill to meet up with Mr. Mud so we could ride up B-OO-B (Bohlman – On Orbit – Bohlman) together. I had to carry our tent poles in a backpack hoping to get them fixed at Mel Cotton after the ride. (Ended up buying the shock cord and fixing them myself in the car the next day.) Enjoyed Highway 9 descent a lot, but got super chilled. And I did not warm up until close to the top of On Orbit. I missed the 93 degree weather we had the Friday before. Slow going on B-OO-B, but glad that we did it. Mr. Mud beat me to the top this time. We had a late dinner near Downtown San Jose, which resulted in going to bed late. Glad that we didn't commit to a Coe ride the next day many our friends were doing. Instead, we slept in a bit, packed up, and drove down to Pinnacles. It was a great day at the Pinns. Perfect temperature. We did a somewhat usual East Side circuit: Plague, Stupendous Man, Broken Arrow, Wet Kiss, Big Pucker, Cantaloupe Death, Feed the Beast, and Rocket in My Pocket. Satisfied on the rock, we moved on. Going from Pinnacles to Hunting Hollow Entrance of Henry Coe allowed us to take a back way, which worked out perfectly. We made it just in time that the Saturday's crew had just had dinner and had enough leftover to feed us and more. (Otherwise, we'd just drive in town which is not far either.) We met a few of our Coe friends and had a pleasant chat on a very unpleasant topic — the idiosyncrasy of Department of Parks and Recreation in their policing actions on the Jim Donnelly Trail work. Take a look at this MTBR thread for a peek. I had told friends before that I couldn't wait for the JDT work to finish just so I would not be remind of the DPR nonsense over and over again. 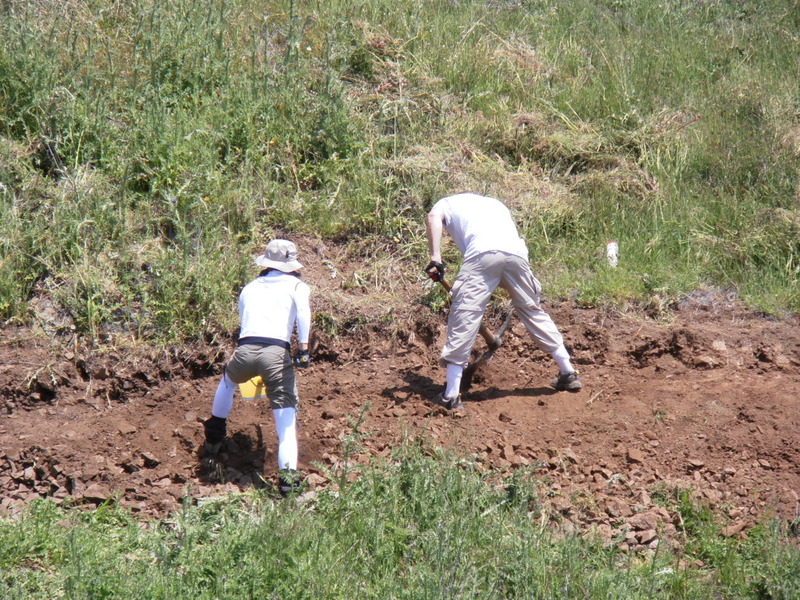 I participated in the trail work as my little effort in expediting the completion. Mr. Mud joined the trailwork to show his appreciation to the few volunteers who put their heart and soul into this project in the past six years (esp. the last two years with intensity), who ironically were driven out of the project by DPR. Argh, enough of that! Thanks to the DPR rangers who couldn't wait to get out of there, our trailwork wrapped up early giving us plenty of time for a ride. I should be tired, but the SportsLegs pills seemed to do wonders. I felt okay pedaling up Lyman Willson, so much so that I passed the Bowl Trail where we should turn left, but went for the summit. The only problem was the real summit was much further than I thought, but I simply couldn't turn around since I hadn't put a foot down. It was quite a while before I finally reached the end of the trail. Turning around, my legs immediately felt tremendous fatigue — from the digging stance during trailwork. On the whole ride, I'd say uphill was almost more enjoyable than downhill because of that. I must be on a roll because I found myself not being able to resist going for all the walls in sight, including finishing upper Middle Steer Ridge Trail, Steer Ridge Road Wall, and finishing upper Spike Jones. My out and backs worked out pretty well for the most part because Mr. Mud was taking it slow going up, and we almost always reached the bottom around the same time. Four activities. I call it a rad weekend… except right now, two days later, I feel that I have been run over by a truck. Every joint in my body hurt. So great!